Jennifer Ackley loves the seven wolf-dogs who live on her property. But they won’t be sleeping on her bed. They won’t be playing with her grandchildren. Ackley never forgets that, as much as they may sometimes look and act like playful puppies, these animals in her care will always be part wild. Since 2013, Ackley has operated Wolf PAWS – Positive Awareness Wolf-dog Sanctuary – on several acres she owns in Dandridge. There, she provides a secure and stimulating home for the hybrid animals, who have enough wolf in them that shelters will euthanize them rather than risk adopting them out. Ackley said many people get a wolf-dog not understanding they’re not the same as a large dog mix – then discover after the animal grows out of its puppy stage that they have neither the skills nor the enclosure to keep them. Ackley, who has a college degree in psychology with a concentration in animal behavior, works as a certified dog trainer, in addition to working in her husband’s family communications business. Wolf PAWS, though, is a labor of love – one that began 12 years ago, with her first wolf-dog, Teyah, which means “Precious” in several Native American languages. Not so for Ackley’s next wolf-dog, named Dakota, or “friend.” He grew fast and ran wild, outgrowing the enclosure Ackley and her husband built at their home in St. Thomas, Virgin Islands, where they lived at the time. And he had a high-concentration of wolf. “He literally would not go into the house,” disliking the confinement, she said. Teyah, who died this spring, and Dakota both made the journey to Dandridge. There, the pack soon included Leia, a female high-content wolf-dog who’d been on a 100-foot tie-out in a North Carolina back yard. “When we set (Dakota and Leia) free, it was just a beautiful sight, to see them run free” in their 1.5-acre, partially wooded enclosure, Ackley said. Next came Moonbeam, a low-content mix with blue husky eyes who was abandoned in Gatlinburg; Alo, meaning “Spirit,” surrendered from an owner in Indiana who found him too much to handle after he kept jumping the fence to freedom; Kimi, or “Secret,” picked up by animal control in Jefferson County; Spirit, from a shelter in Indiana; and Eko, the “new dog” on the compound. All contain at least some wolf DNA, according to testing by the University of California-Davis, but the amount varies. Ackley, who’s since gone through extensive training in wolf-dog management and rescue, tries to pair male and female wolf-dogs according to wolf content and age – though all the animals are neutered. Each pair of wolf-dogs at the sanctuary is in an enclosure, from .5 to 1.5 acres, with trees, water for swimming or splashing, a large doghouse with a ramp to the top “so they can look over their domain,” and logs and other items to climb on. Not to mention a double chain-link fence more than 8 feet high, topped with barbed-wire lean-ins, with a 4-foot “dig guard” fence buried underground, plus security cameras. Ackley uses meat treats – like hot-dog pieces – to reward the wolf-dogs for behaviors she likes. Those she doesn’t want to encourage, she ignores. The wolf-dogs’ diet is a little kibble and a lot of raw meat. Sometimes the sanctuary gets expired meat from Second Harvest Food Bank, if it’s not safe to give to people. Occasionally, hunters donate meat for the animals. Otherwise, it’s expensive. Ackley would like to build enclosures for more wolf-dogs; there’s room for four more, she said. That, too, is an expensive proposition. Wolf PAWS, a 501(c)3 nonprofit, has some private donors and sponsors, but it will have its second annual public fundraiser from noon-5 p.m. Saturday, Oct. 22. 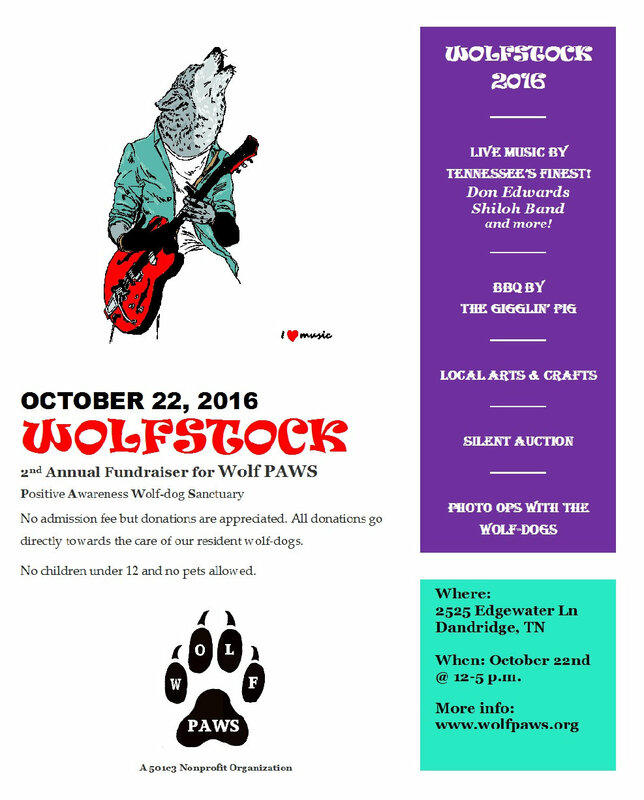 WolfStock 2016 will feature live music by the Shiloh Band, Michael McDade, Danny Bigay and Don Edwards, along with local arts and crafts, a silent auction, and barbecue by the Gigglin’ Pig. There will be tours of the sanctuary, not normally open to the public, although private tours can be arranged. Admission isn’t charged, Ackley said, but donations are appreciated. She’s also selling T-shirts and photographs featuring the wolves at the sanctuary. Neither children younger than 12 nor pets are allowed, for safety reasons, nor are coolers. Ackley has a core group of about eight trained volunteers who help with the sanctuary, which may someday be open to the public, she said. Having volunteers on site helps the wolf-dogs get used to humans, she said. New volunteers can apply at WolfStock or on the Wolf PAWS website. Since many East Tennesseans claim American Indian roots, Ackley said, they may feel a draw to the wolf-dogs. Where: 2525 Edgewater Lane, Dandridge, Tenn.